Jimmy Blass, 51, always knew that diabetes was a possibility. Both his father and grandfather had been diagnosed late in life. Neither had ever struggled with weight, while Jimmy did. After his diagnosis in 1999, Jimmy—on doctor's orders—took a day and a half off work and sought nutrition and diabetes counseling at his local hospital. He learned how to take his blood sugar, count carbohydrates using a points system and maintain a balanced diet. His blood sugar and cholesterol were off the charts, so in his new plan he incorporated as many fresh fruits and vegetables as possible. Now, Jimmy had the necessary tools and know-how to begin managing his diabetes, but even with this new-found knowledge, the most important factor in his success was his father, Mel. 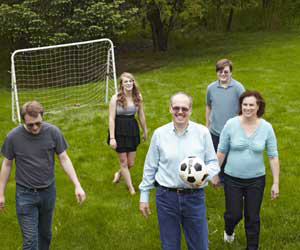 Shortly after Mel’s diagnosis, he lost weight to ease his diabetes management. Jimmy wanted to do the same, but proper nutrition had always been an issue, and he was concerned about being able reduce his 299-pound weight. Jimmy didn't think he could succeed, but his father’s mantra was always, “If it’s important, you just do it.” Mel, who had had years to perfect his own system, reminded Jimmy to test his blood sugar and would even take out his own machine to check Jimmy’s blood. “He would say, ‘You just gotta pay attention, and you’ll be fine,’” Jimmy said. His father’s encouragement coupled with the knowledge he gained through nutrition counseling and his own determination allowed Jimmy to successfully manage his diabetes. Twelve years after his diagnosis, he has lost a total of 100 pounds*, his cholesterol is within a healthy limit, and he takes only one of his original three diabetes medications—at a fraction of the dosage. But Jimmy readily admits it hasn’t always been easy. After his initial 100-pound weight loss, which took him two and a half years to achieve, Jimmy’s weight fluctuated, especially around the holidays. While he hasn't come close to his original 299 pounds in the 12 years since his diagnosis, he makes sure to track portions more closely when he’s put on more than a few pounds. As a father of three, Jimmy has begun to impart advice to his children about diabetes. His oldest child, Jim, 21, has always been the slimmest person in the family. While he doesn’t struggle with weight, watching his father adjust his habits encouraged him to make changes. Jimmy’s concern is for his youngest, Joe, 13, who is built more like his father. “He’s in his growing years, but he seems to be following the same track,” Jimmy said. With a heavier frame and broader shoulders, Joe will probably be bigger than his father. “He needs to eat, but I think it’s going to be tough for him,” Jimmy said. He encourages his son to take control of his eating habits as much as he can. “I tell him, ‘You’re the only one who can control what goes into your mouth,’” Jimmy said. *While Jimmy's weight loss is inspiring, it's important to note that losing this amount of weight is not typical or necessary to improve diabetes control. However, if weight loss is part of your individual diabetes plan, set realistic goals for yourself and keep in mind that even small losses can help lower blood glucose, blood pressure and blood cholesterol levels. And remember, before embarking on any new weight loss regimen, check with your physician first.